This interview originally appeared in Issue One (December, 2012) of The Drummer's Journal. Click HERE to open this issue. Bill Bruford has retired. His website explicitly states this and kindly directs journalists to consult a reading list before requesting interviews. The reading list is divided into several subheadings, each of which house the relevant books and articles relating to the titular subject. These are: ‘Progressive Rock In General,’ ‘Yes,’ ‘King Crimson/Robert Fripp,’ and ‘Genesis.’ If you were unsure of the scale of Bill’s musical background, a glance at this list will testify to its extensiveness. So after all this, what, having becoming one of the most respected drummers of all time, do you do with your retirement? Write a book? Alas, the fifth and final subheading is simply entitled ‘Bill Bruford’ and refers the inquisitive to his biography published in 2009. I can’t quite remember how I discovered he had enrolled as a PhD candidate at the University of Surrey, but in all honesty, I wasn’t particularly surprised to hear of it. During the last three years he has adopted a stage of a different sort and has delivered lectures in the UK, the US and Scandinavia, mostly concerning the drum set’s relationship with creativity and musicianship. His PhD is based on a similar theme. Taking heed of the reading list, I sent out an email. What follows is the result. 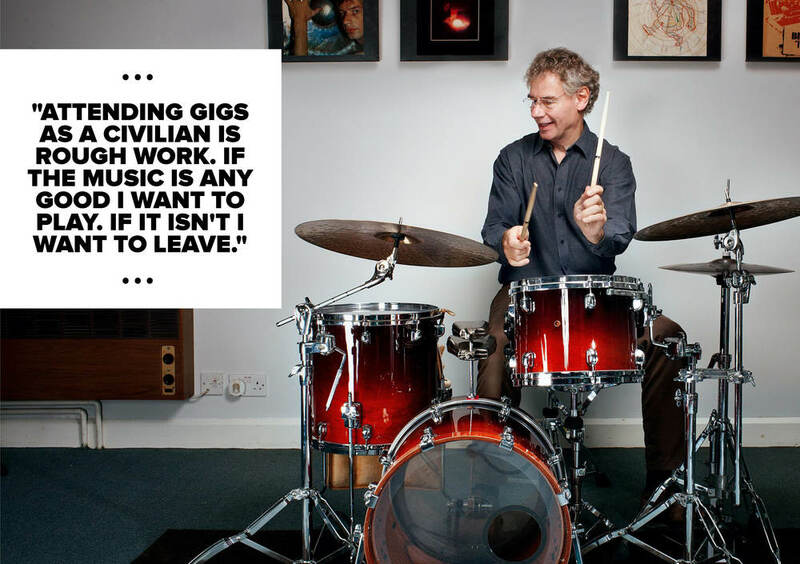 Bill Bruford: What I always liked to try to do when I was a player was make something of a contribution – no matter how tiny – to the understanding of drumming and drummers, what they do, what we expect or want them to do, what might be possible or acceptable tomorrow. I guess you could call me a ‘big-picture’ kinda guy, but you’d have to do so in an American accent. After many years I realised I knew nothing about it, so replaced my sticks with a quill pen and now live in a library. Maybe I’ll find something under the desk that I can share with my colleagues. Researchers don’t have to be happy. I’m framing a question, which will generate a thesis, with several hypotheses, which I shall try to prove or disprove, and then I’ll need a pint. Are you a religious man? Well, I’m a lapsed atheist. I tried, honestly, but I’m just no good at it. I tried shopping on Sundays, but I just couldn’t get into it. If Sunday is a choice between God and shopping, I know which one frightens me the least. I’ve always seen our allotted time here on the planet as a straight line but tragically short; over in a flash. So perhaps one of my many faults was to have been in too much of a hurry. No, much the same old Bruford. My broadband hasn’t got any faster! I rate slow broadband as one of the key agents in the demise of Earthworks. I was unable to buy plane tickets within an acceptable timeframe. My blood pressure is probably lower now. Attending gigs and concerts as a civilian is rough work, though. If the music is any good I want to play. If it isn’t I want to leave. Either makes me a terrible evening out. What’ve you learned about yourself and others through music? I’m very admiring of those musicians who are at peace with their contribution, and able to live with it. I became increasingly riddled with self-doubt, and the maggots of inadequacy. [Is that a good name for a neo-punk outfit – the Maggots of Inadequacy?] For some people - Tim Garland, Gwil Simcock, Asaf Sirkis, to name the last three I’ve seen - the effort becomes effortless, and the music just seems to pour out. Appearances can be deceptive, of course, and underneath the serenity I suspect, like a duck’s legs below the waterline, some are paddling very fast. Some levels just the same, some levels all different. The age old struggle with wood, gut, drumstick, plectrum and mouthpiece remains intact. It’s going to take you 10,000 hours before you get reasonably good. But the context in which the outcome of that struggle is ‘monetised’ - as we used to say here at Lehman Brothers - is frighteningly different. And this social networking thing has got to stop. Luckily younger, wiser people than I don’t care about any of this. They have a laudable ability to just get on with it. I’m not sure anyone is uncomfortable about anything, least of all me. Retiring, of course, implies that you can afford to do so, and I guess that can attract suspicion. I think too many of us are obliged to continue for financial reasons only, which is a shame. The stadia of the world are clogged with geriatric rockers, who tend to prevent the emergence of young blood. The older guys are effectively institutionalised and now know no other life. If they don’t get a proper hotel and a wake-up call they don’t know what to do. I loved Max Roach’s playing. Someone sent me a CD of his latest music shortly before he died, and it was tragic. I didn’t want to remember him like that. You could see daylight between him and the bass player. I never could see the appeal of dying in a hotel room. So in 70,000 words time when you have finished your PhD on why you did what you have done with your life, what next? A trout farm perhaps?